Automotive technician jobs pay a higher mechanic salary with Automotive Service Excellence (ASE) certifications. Get recertified to stay current. An ASE certification is provided by the National Institute for Automotive Service Excellence (ASE), and serves as the benchmark for mechanics all across the country. Being ASE certified proves to both employers and clients that a mechanic is experienced, knowledgeable, and cut out for their automotive technician job. The ASE offers certifications of varying levels, in eight different categories: automotive transmission and transaxle, heating and air conditioning, manual drivetrain and axles, suspension and steering, brakes, electrical and electronic systems, engine performance, and engine repair. Becoming ASE certified requires having at least two years of experience, and passing an exam. 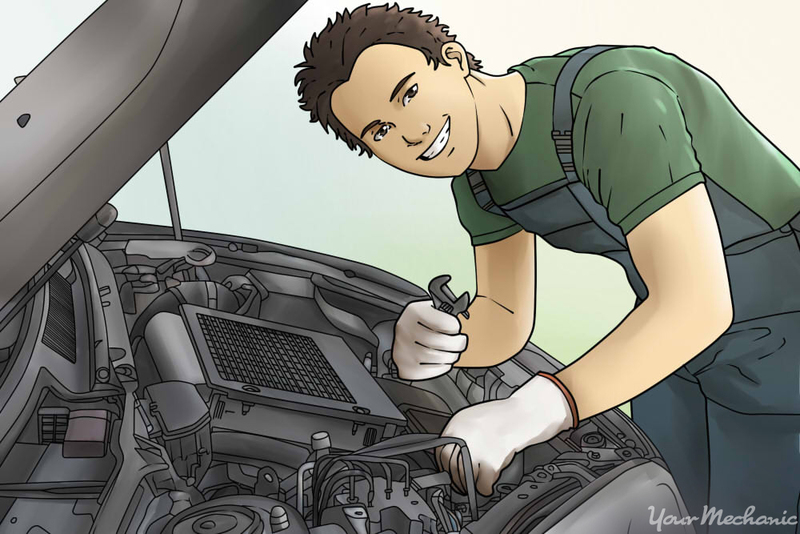 While it takes a lot of hard work and dedication to become an ASE certified mechanic, the process of obtaining certification is simple and straightforward. Every five years, ASE certified mechanics will need to be recertified in order to keep their ASE certification. The purpose of recertification is twofold: first, to make sure that mechanics have retained their prior knowledge, and second, to make sure that mechanics have kept up to speed with the constantly evolving technologies in the automotive world. Thankfully, the ASE recertifying process is an easy one. Step 1: Log on to myASE. Log onto your myASE account on the ASE website. 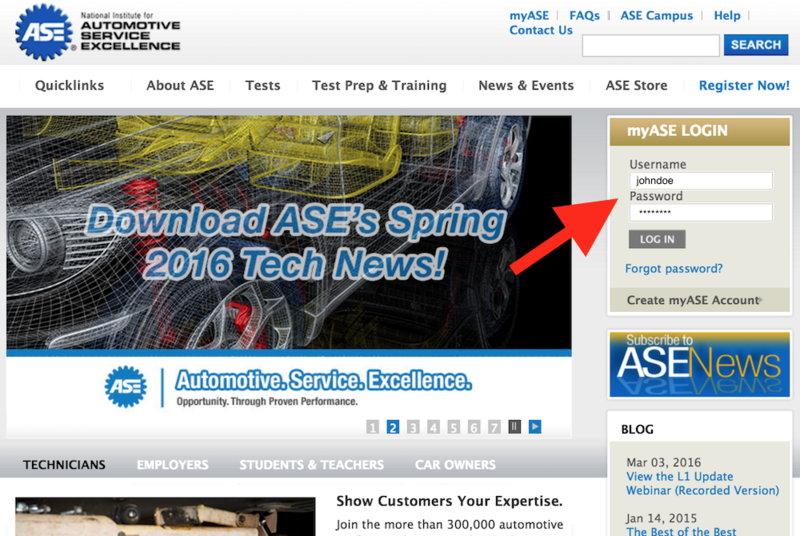 At the top right of the page is an area to sign into your myASE account. If you’ve forgotten your myASE username, search for “myASE” in your email inbox, and you’ll likely be able to find it. If you’ve forgotten your myASE password, click on the button that says “forgot password?” next to the log in button. Tip: If you still can’t figure out your myASE login credentials, or simply don’t want to register online, you can schedule a test by calling ASE’s number, which is 1-877-346-9327. Step 2: Choose your tests. Choose the ASE recertification tests that you would like to take. After logging in, click on the button that says “Tests” at the top of the page. This will take you to a resources page for ASE certification exams. Next, click on the “Register now” link on the sidebar to see registration periods. If it is not currently one of the registration windows, you will have to try again at the next available time. Currently, the registration windows are March 1 – May 25, June 1 – August 24, and September 1 – November 22. If you are currently in one of the registration windows, select all of the tests that you would like to take. You can take as many recertification tests as you would like, so long as you have already passed the primary certification exams in the categories you are choosing. Tip: If you choose more tests than you would like to do in one day, that is fine. You have 90 days after registering to complete all of the recertification exams that you have signed up for. Step 3: Choose an exam location. Select the exam location that is most convenient for you. After choosing your tests, you will be asked to select the test center that you would like to take the test at. Enter your location into the search box to find the test center nearest you, or the test center that is most convenient. 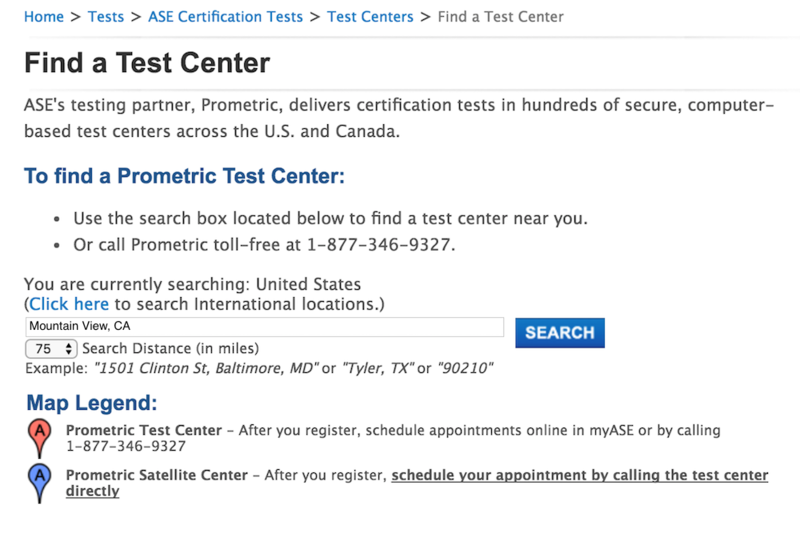 Tip: There are over 500 ASE test centers, so you should have no problem finding a center that works for you. Step 4: Choose an exam time. Select your exam day and time. Choose from the list of options to select which day and what time you would like to take your recertification tests. Step 5: Pay. Pay the fees for your ASE recertification tests. To finish your registration, you will have to pay the ASE certification test fees. You can pay your registration and test fees using any major credit or debit card. Tip: Always save your test and registration fee receipts, as you can write them off as a business expense on your taxes. Warning: If you cancel your test within three days of registering, you will receive a full refund. If you cancel it after three days, you will be charged a cancellation fee, and the rest of the money will be put into your myASE account as ASE credit, which can be used for future tests and fees. Step 1: Prepare. Prepare for your recertification exams. If you’re feeling at all unprepared or nervous about your ASE recertification exams, you may want to do a little bit of studying. The ASE provides study guides, which are free to download and offers practice tests. Step 2: Take the tests. Show up and take the tests. On the day of your recertification, show up at your chosen test center at least 10 minutes before your chosen exam time. Take the recertification tests that you signed up for. 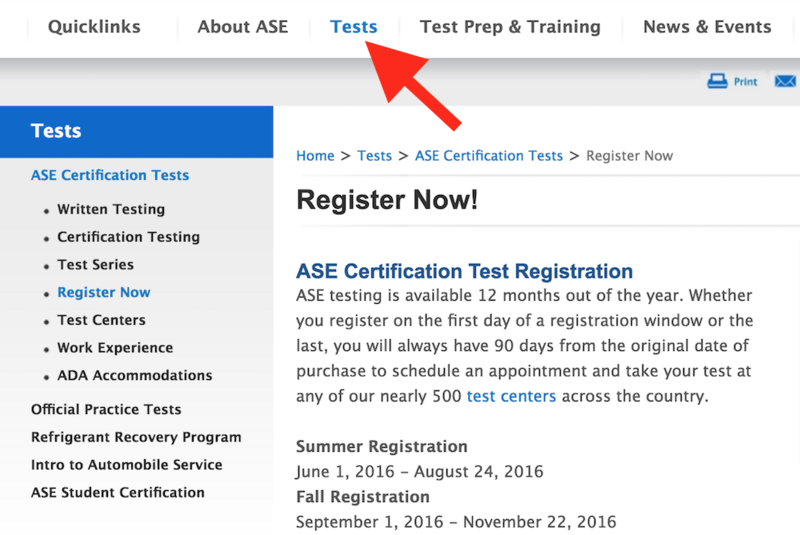 Tip: Most ASE recertification tests are significantly shorter than the initial certification exam that you had to take. On average, a recertification exam has about half as many questions. Step 1: Track your results. Track your results on the ASE website. To find out how you did on your recertification exams, log onto your myASE account. Use your account page to find the “Track your results” feature, which will let you find out the scores of your recertification exams as soon as they have been processed. Step 2: Get your recertification. Receive your recertification notification in the mail. Shortly after passing the recertification exams, the ASE will mail your certificates to you, along with your results. Staying on top of your ASE recertification means that you can continue to be seen as a reputable and trustworthy mechanic by current employers, future employers, and all clients. You can use your continued ASE certification to grow your customer base and charge higher rates. If you’re already a certified mechanic and you’re interested in working with YourMechanic, submit an online application to work for YourMechanic for an opportunity to become a mobile mechanic.